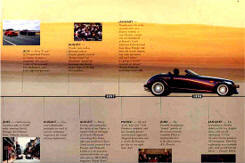 This mega brochure fold out is simply beautiful. 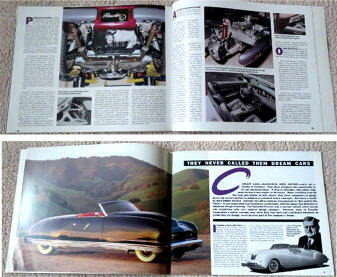 Crystal clear photos of the Prowler at various angles and loads of statistics about the roadster. 16 ½ inches long by 5 ½ inches tall. When fully opened it measures an incredible 33 inches long by 11 inches tall. 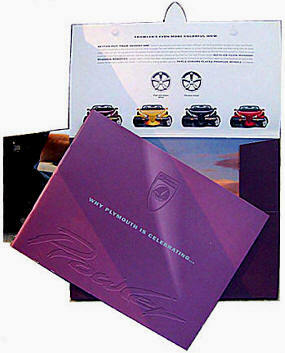 Printed by Chrysler on first rate gloss stock paper. Printed on both sides. 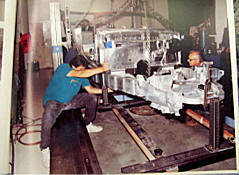 The 1999 Prowler model year the year the Prowler goes into full scale production. 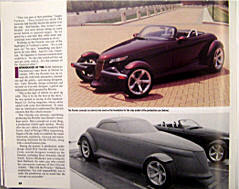 Featuring the Black Prowler for the first time. Also featuring the Purple Prowler available with chrome wheels for the first time. 10" X 13" when folded. 6 pages. 10" X 39" when fully opened. 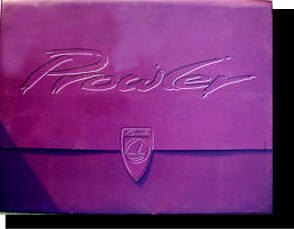 Beautiful full color photos of the Prowler. Offering four colors starting this year Purple, Yellow, Black, and Red. 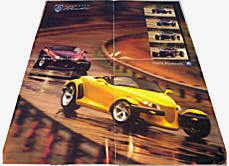 What spectacular photos of the new 2000 Prowlers this has. First introduction of the special Woodward Edition (Black and Red). 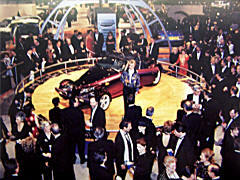 Includes all options available, statistics and information about the 2000 model. 6 pages. 9 ½" X 12" closed. Opens to 8 ½" X 22". 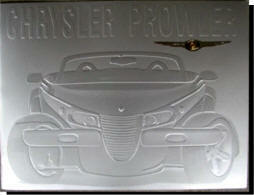 Produced by Chrysler for the 01 Model Year. Highlights the 2001 Orange and 2001 Silver Prowlers. 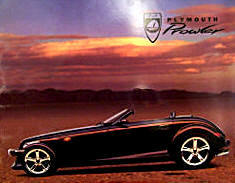 First Brochure to offer the "Black-tie" Edition Prowler. Extras, options and technical statistics are all described in detail. 9 1/4" X 12 1/4" closed. Opens to 9 1/4" X 22". Has 6 pages total. 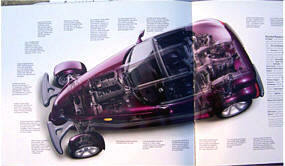 If you are fascinated with your Prowler and it's history you will have to have this book! The only book ever made specifically about the Prowler Story! 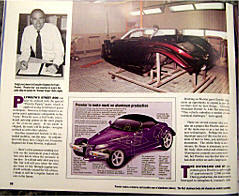 It's 40 pages of information and photo packed pages tells the story of the idea behind the Prowler and how it came to be. 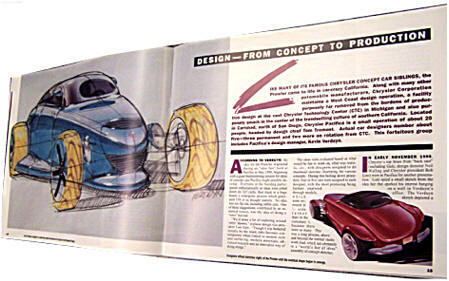 Starts from the very beginning and includes very rare concept drawings of the Prowler and other development information. Development from an idea How it was built by hand. 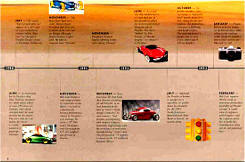 "The Complete Story of the PROWLER!" HIGHLY Recommended for any Prowler Owner! 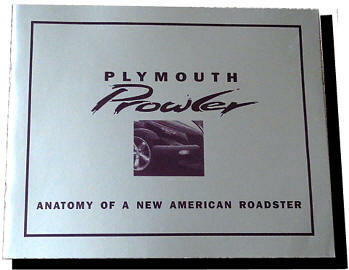 EB-PPB001 The Original 1997 Plymouth Prowler Dealer Sales Mailing Brochure! Produced in 1997 by Plymouth. 3 3/8" X 6 3/8" tear out post card. Sparingly given to serious prospects in the Dealer Showrooms this is a - Great historical piece to have with your one of a kind classic car.